It's negative one outside with a windchill of negative 17. I'm wearing my slipper boots and cardi and drinking warm tea with honey cause baby, it's cold outside! And this post may be a heavy dose of navel gazing but my fingers want to type and I want to write this out and so I hope you don't mind sitting with me through this. p e a c e like an exhale and I repeatedly had this image of a clearing in the woods. The woods, dense and dark and scary, were behind me and in the distance there were more woods, though not has thick or scary. But I was standing in an open field with tall green grass and sweet flowers. In September I attended the Blessed Is She writers' retreat and there the fabulous Beth Davis was praying over me. She said, "Bonnie, I don't know if this will mean anything to you but I just see this huge field of wildflowers for you" and BAM: ugly cry. There it was from someone else - the same Holy Spirit showing the same promise for me to both of us. I will readily admit, I was overwhelmingly relieved. It was at that same retreat, though, that Travis called me to let me know that he was at the emergency room because he was experiencing loss of balance, numbness, and other signs of a stroke. The ER doctor thought it was actually his body reacting to stress and exhaustion (football season + seven kids + hard work around home) and I wasn't scared. Because that field of wildflowers was as good as Noah's rainbow. I came home from the retreat and there were more tests for Travis. Our family doctor suspected that Travis had MS which was showing itself because of exhaustion and stress but I held out hope. In the end all the neurological issues went away with allergy medicine and sleep. Seriously. And the words from Isaiah rang so true in my heart, "God indeed is my Savior. I am confident and unafraid." Halloween and Thanksgiving and Advent came and went. Our family was healthy and happy with the kids growing and learning and things going well. A clearing in the woods, filled with thriving wildflowers. And as the New Year approached people started talking about adopting a saint and a word of the year. I've never done the word of the year thing before because, well, I thought it was weird, but as the conversations began I remembered that St. John Paul the Great was the saint appointed to me by Jennifer Fulwiler's saint generator last year. Back then I thought, "Oh yeah! He's great! What wonderful, evangilistic things will come my way?" but now I see that he probably wanted to walk with me through all that suffering and I had, for the most part, forgotten about him. Stupid me. But this year I am paying attention. I have this feeling that God is calling me to do beautiful work for Him in the hidden, quiet, normal of my home and daily life as wife and mom. St. Cecilia was the saint given to me this year and I think she wants to show me how to live so that my heart is always glorifying God. And this year I decided to try the whole word of the year thing and as I prayed about it, at home and Mass and adoration, I kept coming back to the word "be." It isn't flashy, in fact it seems to reinforce the hidden and quiet that I already mentioned. And then (!) the word that was randomly chosen for me from Jen's word of the year generator was BLOSSOM. It's different than thrive, you know, which seems to have to do with *doing* whereas blossom seems to be about *being. * Just do what you do, be who you are meant to be and you will blossom... in a a field of wildflowers... in a clearing in the woods. There is a peace in heart and a hope in my Lord and I know that whatever happens God is good. You can find your saint here. Have a word of the year picked here. What a beautiful post. At mass yesterday there was a part of the homily about finding God in the ordinary and it struck me how often I am disappointed because there isn't a burning bush and God isn't sending me on an important mission. But I think I am just missing the point. Tonight I read my Bible while my son and husband played video games...God in the ordinary. My word of the year was Story. I wonder what story God has in mind. Prayers for you this year as we find God on our everyday lives. What a year, Bonnie - Happy New Year! It was a pretty quiet year for me too. I wanted to do such big things, but I also felt God calling me to the little moments. Cheers to and prayers for a blessed 2018! From watching you and your family grow, you certainly seemed to have blossomed in your role as a mom. Your posts (mostly on Instagram) always make me feel warm and cozy and I can just see how much you love your vocation and your family without being in-your-face about it. You are doing great work, and your inner peace is a shining light to us all. 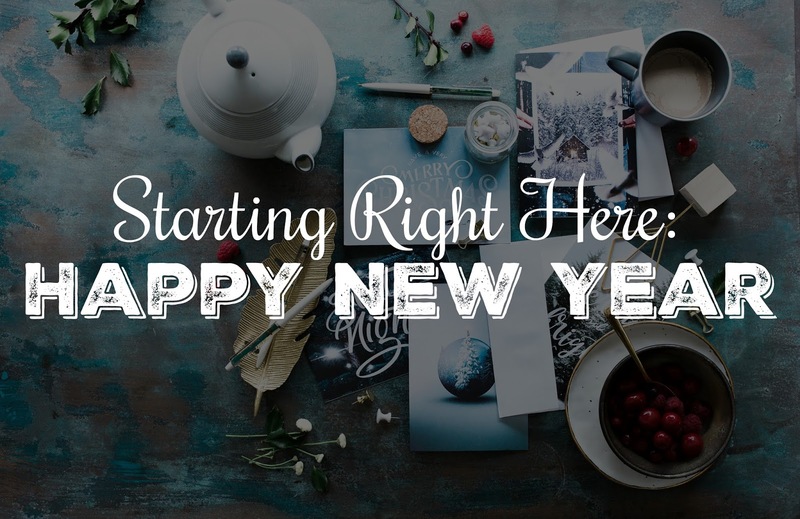 I'm hoping your're back to blogging a little bit this year! My word (so thanks to Jen Fulwiler because I would not be randomly picking a word myself) is Infinite. My saint is St. Joseph, because he has already been helping us for a few months and is the patron saint of several things my husband and I are pursuing currently. It was cold this weekend but the frozen snow was so beautiful! Happy New Year!